The University will be closed in observance of Cesar Chavez holiday on Monday, April 1st, and Memorial Day on Monday, May 27th. CSUN-al Gardening Series: Backyard Beekeeping - What's the Buzz About?, Saturday, January 19th 9 - 11 a.m.
Backyard Beekeeping - What's the Buzz About? 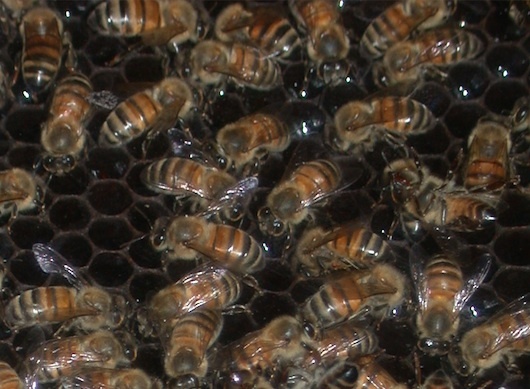 Saturday, January 19th, 2019 9 - 11 a.m.
On Saturday, January 19th, from 9 - 11 a.m., professional beekeeper Keith Roberts will explain the important role of honey bees on a local, state, and global level, and what we can do to protect them. He will provide an insider's view of the benefits and risks of keeping bees, along with general information on how to get started in beekeeping. "Even if a homeowner doesn't want to host a hive, there are plenty of reasons to welcome honeybees to the garden," states Brenda Kanno, manager of the CSUN Botanic Garden. "Bountiful fruit and vegetable production often depends on the industrious pollination actions of honeybees." Mr. Roberts' interest in honey bees began in 2008, when a visit to the LA County Fair introduced him to a display of live honey bees. He must have been smitten, because just a year later he founded the Enterprising Bee Company, and subsequently created the Save the Buzz line of honey bee products. As a professional beekeeper, Keith is co-owner of The Valley Hive (https://www.thevalleyhive.com/), which specializes in promoting Urban Beekeeping by providing hobbyists with bees, equipment, training, and education. He is past president of the LA County Beekeepers Association. Registration for the free class is required. Please E-mail botanicgarden@csun.edu to request a space in the class or for more information. Driving and parking instructions, as well as the class meeting location, will be sent upon registration.